To their credit, the early settlers of Paisley and vicinity soon recognized the importance of education. The first attempt at anything of the kind was in 1850 when Miss Stewart taught a private school in the shanties at Valentine’s mill - about a dozen pupils attended. 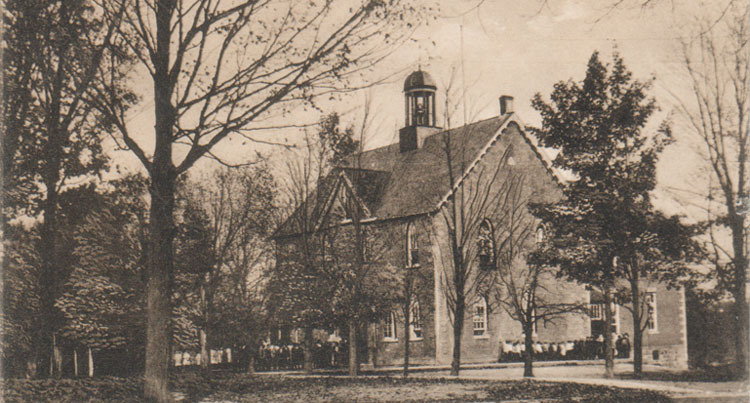 At a public meeting held in September 1856, steps were taken for the organization of a school under the provisions of the Upper Canada Consolidated School Act. Trustees elected at this meeting were Thomas Orchard, Wm. McBride and John A. Murdoch. The site selected for the school was the centre of lot 11, Concession A. 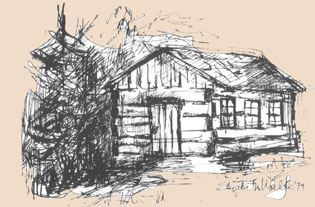 The building was to be 24’ by 2O’ inside, built of flattened logs. The tender was let to John McDonald for $120. Miss Stewart was offered the position of teacher at £50 per annum on condition that she obtain a legal teaching certificate. She and subsequent teachers taught for periods of about one or two years each. In 1863, part of S.S. No. 8 Greenock was added to the Paisley section, and the teacher’s salary was increased to $380. To young pupils, an intriguing feature of this school was a handsome map case attached to the log wall by wooden pins. By careful manipulation of strings with wooden knots on the ends, the teacher could produce any map he wanted - a real feat of Wizardry to the young folk. Two rows of pine desks, and a wide space between them where the classes stood for recitation, accommodated the pupils. The desks at the back of the room were reserved for “the big boys with whiskers”. By the mid-sixties this log school, showing signs of demoralization by the usual pranks, was moved to a farm to be used as a stable. In june 1866 the contract was let for a new one-room brick school. It was opened in July 1867. Two years later, the principal, who was an ardent cricket player, began the logging and cleaning up of the ground between the school and the station for a cricket field. About this time, the Department of Education issued a ruling that subjects other than reading and spelling should be emphasized. Prior to this, a pupil proficient in reading and spelling could keep advancing even though he knew little about other subjects. The “limit table” as the new approach was called, produced much howling and turning back, but as more stress was put on arithmetic and other previously-neglected subjects the system began to adjust itself. A strong patriotic sentiment was communicated to the minds and hearts of the pupils when they sang with fervour, “Britons never, never, never, shall be slaves”. (The first two schools were situated on the property now occupied by Leonard Schildroth). In January 1872, the trustees called a meeting of the ratepayers to consider the site of a new and larger school. The site on the east side of Albert Street at Inkerman Street was selected, and the former site was to be sold “for what it would bring”. In June the contract was let to Sinclair and Blackburn for $4000. With the new school went the idea of a new staff, and a principal and two assistants were hired. In 1888 it was found necessary to build an addition to the existing building. The rooms already in the building were enlarged and made more convenient, and two new rooms added. In time, six rooms were needed to accommodate the increasing attendance. 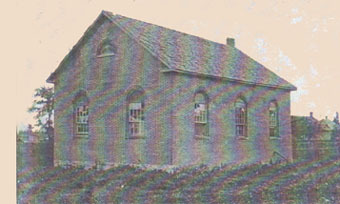 As far back as 1897, Continuation School classes were held. In 1901 an assistant teacher for the Continuation School was hired. On February 15, 1914 fire destroyed this school. All equipment, books and personal possessions of both teachers and pupils were a total loss. Insurance on the building was $5000; on the contents, $1500. While the new school was being constructed, classes were held in any available space - the council chamber, library and stage of the Town Hall, the armouries (now James Friar’s woodworking shop), the carpet factory, and part of the Stark Block. 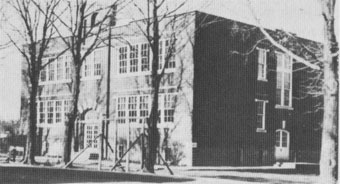 Four rooms on the first floor were occupied by elementary classes, and four rooms on the second floor were the continuation school classrooms, including a well-equipped laboratory. 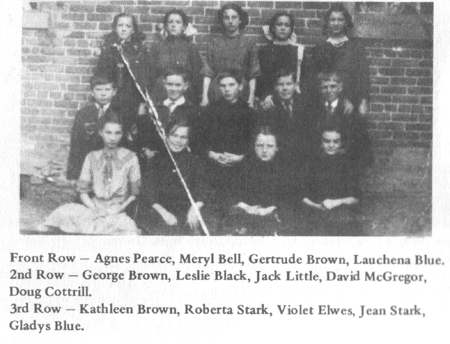 In the 1920’s a second assistant teacher was added to the staff of the Continuation School. (A second assistant teacher could be hired only if the minimum enrolmont was 60), Normal School Entrance and Junior Matriculation were the limits of education in the Continuation School, until in the late 1930’s subjects of the Senior Matriculation were included in the curriculum. From this time on it was no longer necessary for a pupil to attend a High School or a Collegiate Institute to obtain his Senior Matriculation (Upper School or Grade XIII). This system continued with no startling changes until High School Districts were established. 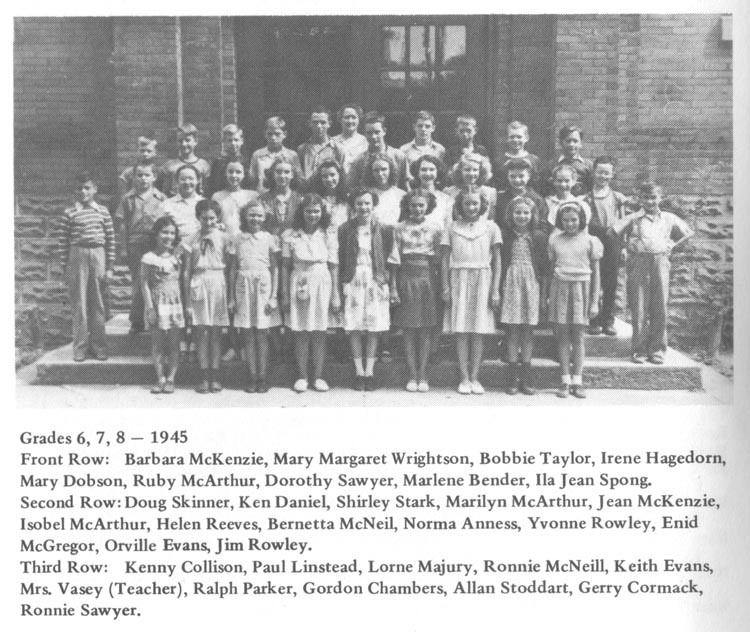 ln 1951 the Paisley Continuation School closed, and pupils and teachers were transferred to the District High School at Walkerton. Daily bus service transports the pupils to the District School. 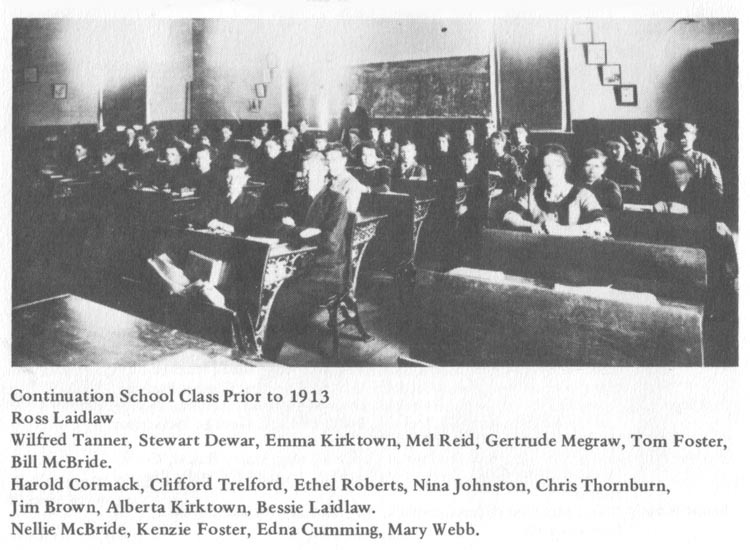 The Closing of the Continuation School provided more classroom space for the expanding Public School. Limited bus service began bringing pupils from some one room rural schools whose attendance had dropped to the extent that their operation was not economically sound. The Elderslie-Paisley Area was formed in January 1965. As more of the one-room schools were closed, the school area expanded in 1967 to include Paisley, Elderslie, Brant (part), and Greenock. The new school houses three “traditional” classrooms, an open area designed for six or seven classes, a library and resource centre. In addition to the teaching units there is a gymnasium-auditorium, a health room, kitchen area and offices. The building is electrically heated and is equipped with a public address system. There are 330 pupils and a staff of 13 teachers. Since the opening of the school, increased enrolment has made necessary a seventh class in the open area, and the use of a portable classroom outside of the school proper. Over the years many citizens have given freely of their time and abilities in serving on the School Board. Their work in seeing that adequate housing was made for education, securing teaching staff and general administration, deserves our sincerest appreciation. From these schools have been graduated many students who have been successful in different professions, in industry and in other vocations. A school history would be incomplete without some tribute to the many dedicated teachers, who, over the years, have promoted the cause of education. 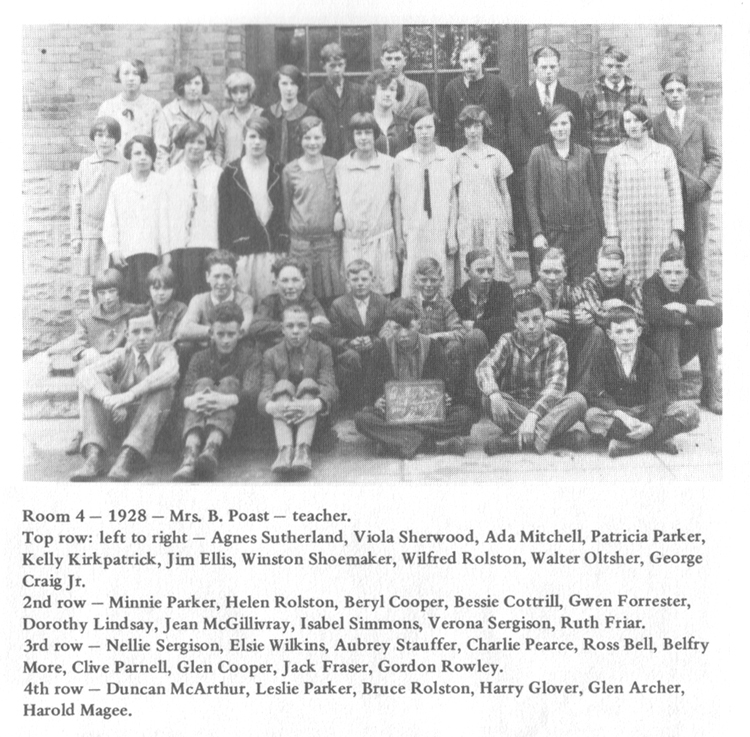 Space does not Permit listing individual names, but among them there are two - Mr. J.B. Vasey of the Continuation School, and Mrs. J.B. Vasey (formerly Mrs. Poast) of the Public School, who have each devoted many years of service to the Paisley Schools as these biographies that follow indicate. 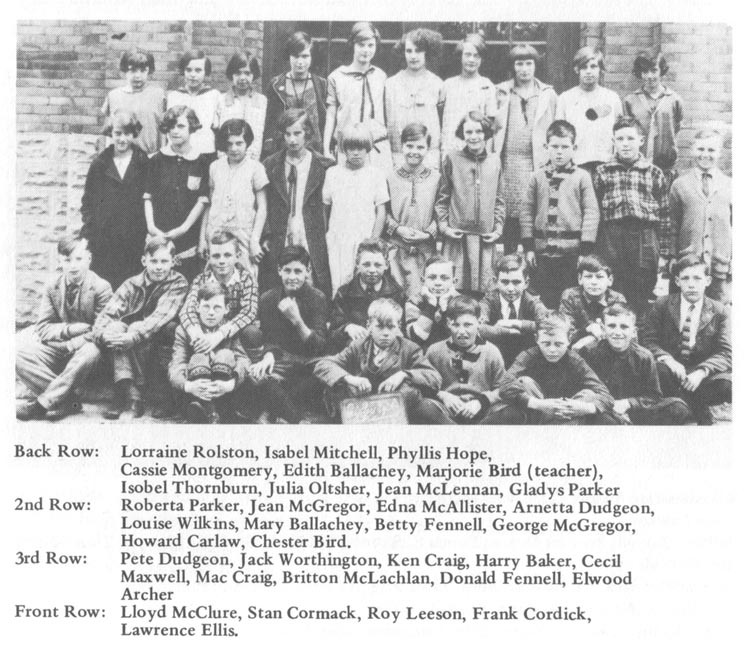 Pupils of Paisley elementary school classes will retain fond memories of the teacher who came to the community on October 12, 1926 after the Thanksgiving weekend to take over the instruction of Grades 5 and 6, and then, in September 1927, was chosen as teacher for Grades 7 and 8 and interim principal of the public school. Later this newcomer to the area, Mrs. N.L. 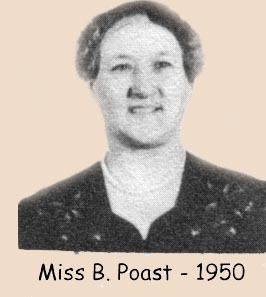 Poast of Badjeros and Owen Sound was named school principal, an appointment she retained until her ultimate retirement in June, 1959. 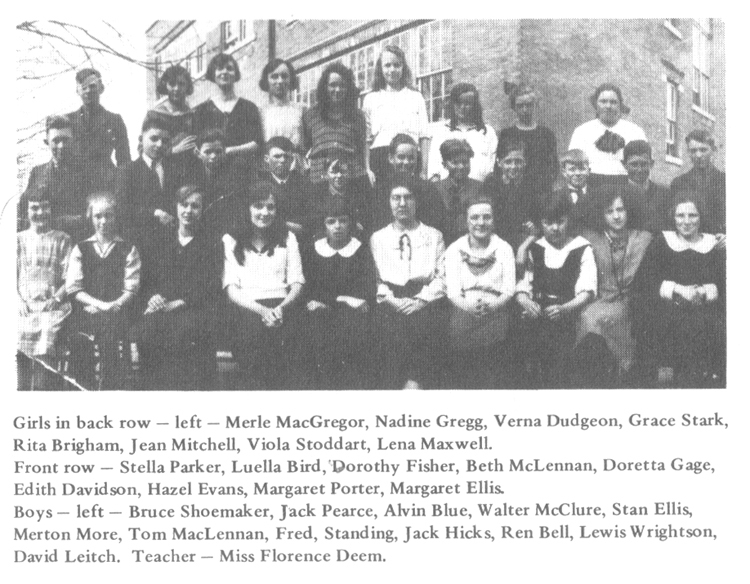 In 1952 Mrs. Poast married another of Paisley’s favourite teachers, John B. Vasey who was then teaching in the Walkerton District Secondary School. 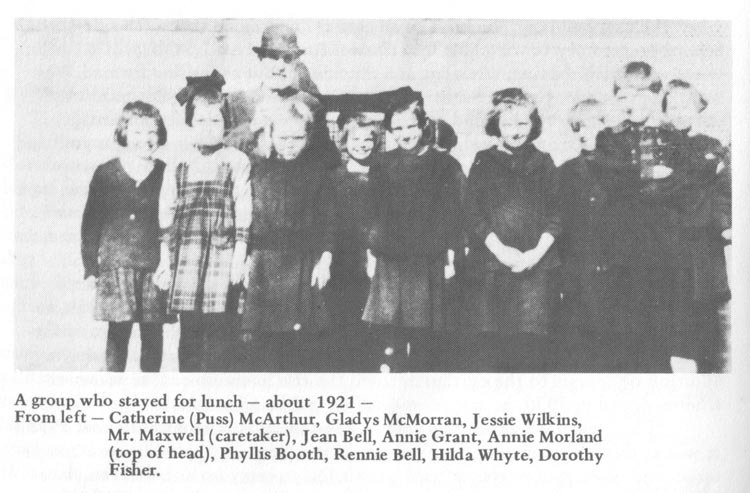 Mrs. Vasey served under many inspectors - Messrs. Bald, Dobson, Gilroy, Game and Hougham and during her 32 years in the Paisley school drew nothing but laudatory reports from those overseers of Bruce County education. 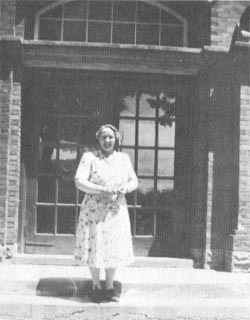 During his final visit to Paisley classrooms, Mr. Game remarked that he thought that Mrs. Vasey held a record for the greatest number of years a woman had served as principal of an Ontario public school. During the term she served as president of the Bruce Teacher’s Federation, she, along with Mr. Game, arranged their convention to be held in New York City, the scene of the World’s Fair at that time. Hundreds of pupils, as well as their parents, will attest to the truth of Mr. Game’s statement. Just a few weeks ago we walked past the former Paisley Public and Continuation School building. Despite the fact that the aging brick structure no longer houses eight classrooms within its walls, but instead has been converted into apartments housing residents of the community, and although the laughter and shouts of village and area youngsters no longer echo across the surrounding area which was once the playground for the school, our thoughts went back to those long-gone days when we occupied one of those desks more or less much against our own inclination. We remembered our earliest days in Paisley’s schools, for we had begun our elementary school training in the old school, later destroyed by fire, under the guidance of a kindly preceptor, Miss Elizabeth Miller, who so capably set so many youngsters on their first, uncertain steps along life’s rugged path. After Miss Miller, it was our continued good fortune to progress, in a vacillating and sometimes vague way, through the promotions: second book, to third book, and ultimately, to fourth book, as the rooms were termed in those days. 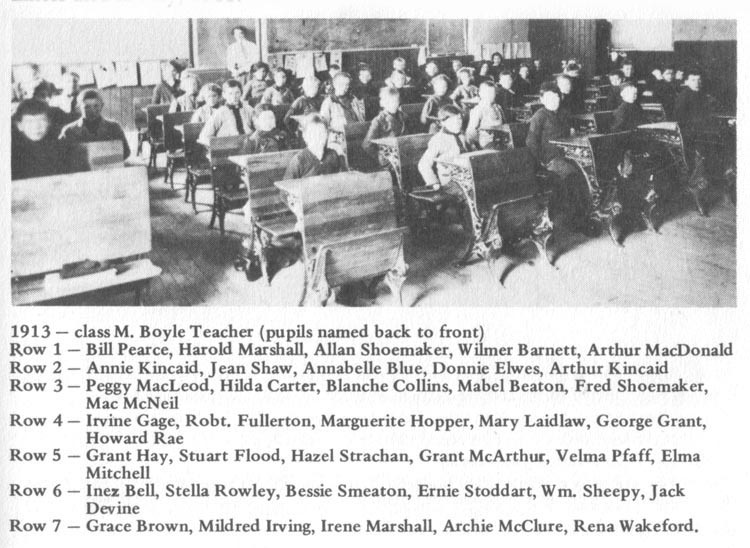 The teachers we recall with admiration and affection were Ina Galbraith, May Boyle and Margaret Davidson, all of whom were absolutely dedicated to their profession … and could expertly wield the strap, when the occasion called for such punishment. Ah, those were glorious days, and would that we could but relive them under the same circumstances of that past era. Urged on by those aforementioned tutors, we finally made it into Continuation school classes, and here it was we came into the capable hands of one of the most unforgettable, most consecrated educators we have ever known. 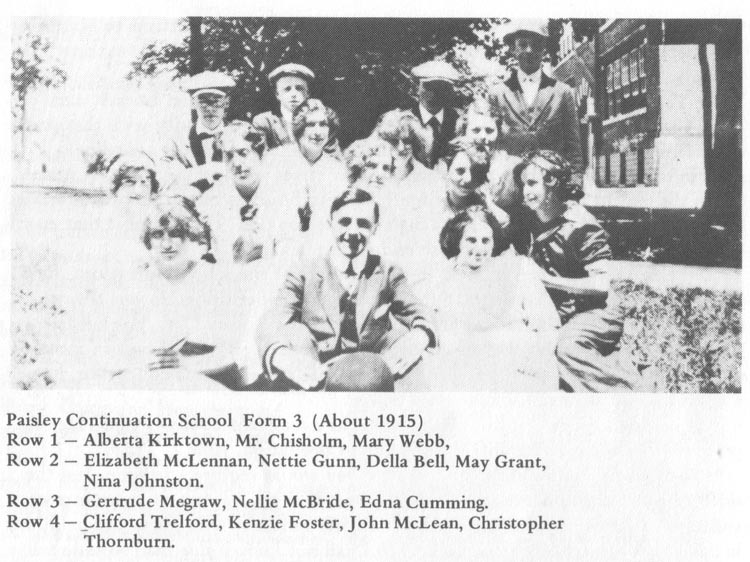 Our own introduction to “J.B.” came on the opening-day of school that September of 1920. Not one of the school pupils had ever laid eyes on the new schoolmaster until that morning. As had become the custom, when the first bell rang, the boys of all classes lined up on the north side of the school preparatory to marching into classes. And, as was also the unruly custom, there was much shoving, wrestling and mucking about as the line formed. We were one of a trio, Jimmie Sutherland and Charlie Rae were the others, who sought to bring up the tail-end of the line up. As we wrestled for advantage, something came from behind, strong arms reached around two of us, myself and Jimmie, and our heads were clunked together like a pair of hollow cocoanut shells! Whipping us into line, the newcomer strode to the front of the line, looked us over very carefully for a full minute, and then read the riot act. From which we learned that the new commander-in-chief was the boss, and no shenanigans would be tolerated in the future. After serving with the Canadian army during the first World War until demobilization in May, 1919, “J.B.” taught in Galt from September, 1919, to June, 1920, coming to Paisley the following September. Here he taught mathematics, science and physical training in Continuation school classes. 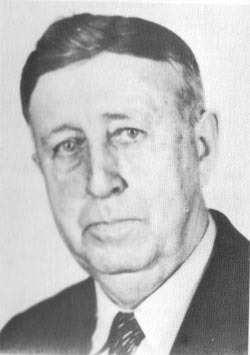 With the addition of courses to the curriculum, and the rise in enrolment, he was overwhelmed, and in 1930, he was relieved of his public school duties. 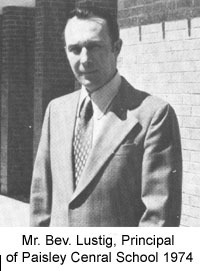 “].B.” remained as principal of the Continuation school until June, 1951. 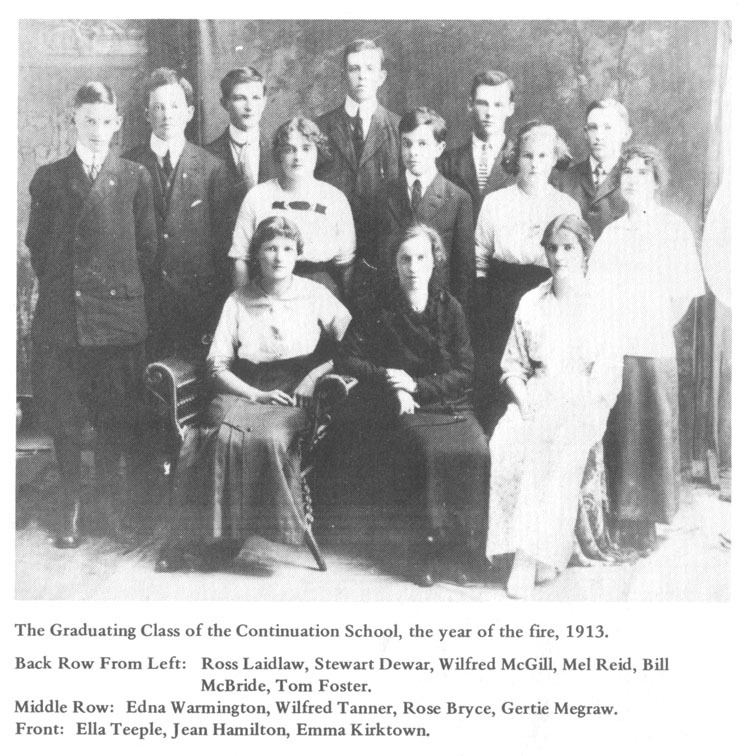 It was at this period in county education, that central high schools were inaugurated, and when Paisley was refused permission to carry on its own secondary school education, it was agreed to send village and area students to Walkerton high school. When the bussing started, “J.B.” joined the Walkerton high school staff, where he taught mathematics, trigonometry, physics and the sciences until Christmas of 1958, when illness forced his resignation from the vocation he loved so dearly. He returned to his home in Owen Sound, and after a lengthy illness died in May, 1961. For the hundreds of girls and boys who had the good fortune to obtain their secondary school education under the guidance of “J.B.”, his passing brought back beautiful memories of those earlier days. They remember that for “J.B.” a school day was not just from 9 a.m. until 4 p.m. They knew that if they were experiencing difficulty with that math or science problem, they could go to him at the end of class for added help … even in the evening groups of us many, many times went to his boarding house room and put in two, three and sometimes four hours as our principal unraveled the puzzles for us … and in most instances, it was this “extra” boost that enabled many of us to get through those end-of-term exams. “J.B.” took a keen interest in every aspect of the school operation: field days, concerts by the students, public speaking competitions. He was always deeply involved in community affairs including the Rotary Club, the fall fair, plus the hockey and baseball clubs, which in those days, ranked high in sports circles. For he was not only a wonderful teacher and guidance counsellor, he was a most valued citizen of his adopted village. Incidentally, in 1953, he was chosen as a recipient of the Queen’s Medal, presented on the occasion of Elizabeth II’s Coronation, June 2, 1953. To tell the whole story of “J.B.” Vasey would require a volume, and the skills of a writer more talented than this one. But, get a group of those former students in Paisley school together, those girls and boys who knew and held him in such high esteem, and an outsider who had not known this man would realize that he was a person made up of all the qualities needed in a man or woman who chooses education of the young his life work. In his classes there was no such thing as boredom. His job was teaching … and in this self-chosen vocation he was superb. We, who passed through his hands, were very, very fortunate. The photo on the left seems to have been taken about 1910. Anyone know when and where?